Whether you’re planning a relaxing family getaway, a fishing or hunting excursion, a kayaking expedition or a winter adventure, Deadhorse Lodge LLP provides an unforgettable immersion into the some of the last truly unspoiled wilderness in Wisconsin. 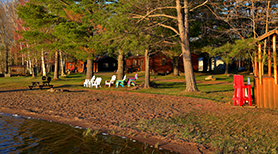 Located on the pristine, virtually undeveloped Turtle Flambeau Flowage, Deadhorse Lodge LLP offers seven premium cabin rentals, several with year-round availability, pier access and excellent water views. With TV, fully equipped kitchens, tasteful decor and updated furniture, our deluxe cabins provide all the comforts and amenities of home combined with the scenery, privacy and peace that are unique to the Turtle Flambeau Flowage. Plus, our beach-front tiki bar and fire pit provide hours of relaxing entertainment for all ages. 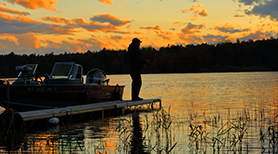 With more miles of shoreline and underwater habitats than much larger waters, the nearly 19,000-acre Flowage offers a world-class fishing experience for the experienced and novice alike. 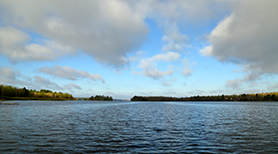 A class “A” musky zone, the Flowage also provides exceptional walleye and smallmouth bass fishing, as well as largemouth bass, perch, crappie, bluegill, northern pike and more. No matter how many times you’ve fished the flowage, its endless inlets, points and islands guarantee you’ll always find a new place to explore. Many guests compare its varied geography to the Boundary Waters along the Minnesota/Canada border. Numerous boat launches are available throughout the Flowage along with several guide services to help you make the most of your stay.